Time to start the game again. All you need to do is pick one driver per race and their finishing position is the number of points you will score. The person with the lowest score at the end of the season will win. For instance, if you pick Andrew Jordan for a race and he wins then you score 1 point... Should you choose Jeff Smith and he finishes 17th, then you score 17 points. I've tried to keep it simple and allow you to enter now and basically forget about it for the rest of the season. 01) The person with the lowest total score at the end of the season will be the winner. 02) Pick one driver per race (first name and surname, only the driver, not the finishing position). 03) You can only choose a driver once in the season. It is your responsibility to ensure that you have not picked a driver more than once. Any duplicate picks will earn a maximum score (32 points), regardless of how many cars are entered for that race. 04) There are 30 races and 32 drivers, so you must have 2 drivers unused. The two unused drivers will be backup drivers. 05) Points will be awarded based on the finishing position of the driver picked... i.e. 1st scores 1 point, down to 32 points for a 32nd place finish. 06) Should a driver retire from a race, then you will score points for the equivalent position they finish in... i.e. the driver to retire first finishes 32nd, therefore 32 points will be scored. 07) Should more than one driver retire on the same lap, then those drivers will score the same number of points... e.g. if five drivers retire on the first lap, each of those drivers will score 32 points. 08) Should a driver fail to start a race or be disqualified/excluded, then you will score points equivalent to the total number of cars entered for the race. 09) Should a driver be replaced or substituted, the replacement will count as your pick. 10) Should a driver miss a round and not be replaced, your 1st backup driver will count as your pick. Should a second driver miss a round without being replaced, your 2nd backup driver will count as your pick. 11) Should a third picked driver miss a round without replacement, only your best 29 race scores will count towards the game. Should a fourth driver miss a round, only 28 scores will count, and so on. 12) If a driver misses a round without being replaced and nobody picks them for that round, rules 09 & 10 will be ignored. 14) Picks can only be changed, updated or amended up until 00:00 GMT Saturday 1st April 2017. 15) Late entries are welcome, but you will score maximum (32 points per race) for each race that has been completed prior to you joining. 16) Late entries must be posted before 00:00 GMT of the Saturday before an event, otherwise you will score maximum (32 points per race) for that event. 17) Scores will be updated as soon as possible after each event. 18) A tie breaker is required to avoid any potential equal scores. The tie breaker will only be used at the end of the season and in the event that any entrants have the same scores. Tie Breaker - What will be the cumulative score of Ford drivers in the overall drivers' championship at the end of the season? The entry list can be found here. 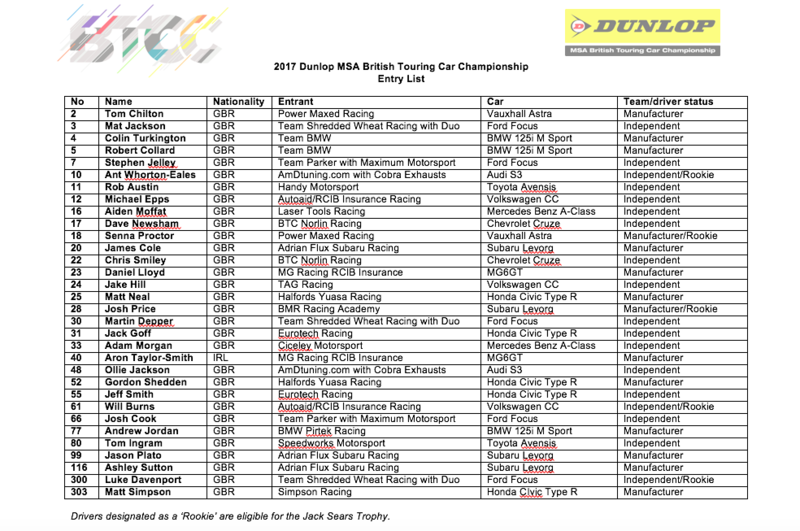 New technique this year, I've gone with the list I chose last year - with the drivers swapped out for their 2017 replacements (eg Hunter Abbott replaced by Tom Chilton). It's taken a bit of thinking - and I've had to swap some people around because of TBL switches, but this is roughly the same as last year. Time for me to come last as usual! Thanks for doing this again! There's a 400 tie-breaker two posts previous? In which case it should come down to the person with the best avatar at the time of entering. This year, mine will be Team Reverse Alphabetical Order. If previous years are anything to go by I'll be languishing in mid-table in no time!